This fine church (shown left, from the southwest), in its tranquil position by the River Parrett, is another member of A.K. Wickham's "Quantock Group", a full explanation of which is given under the entry for St. Mary's, Bishops Lydeard. Wickham's attempt to classify the late Perpendicular churches of Somerset in 1952, was actually just a refinement of the ideas that Dr. J.F. 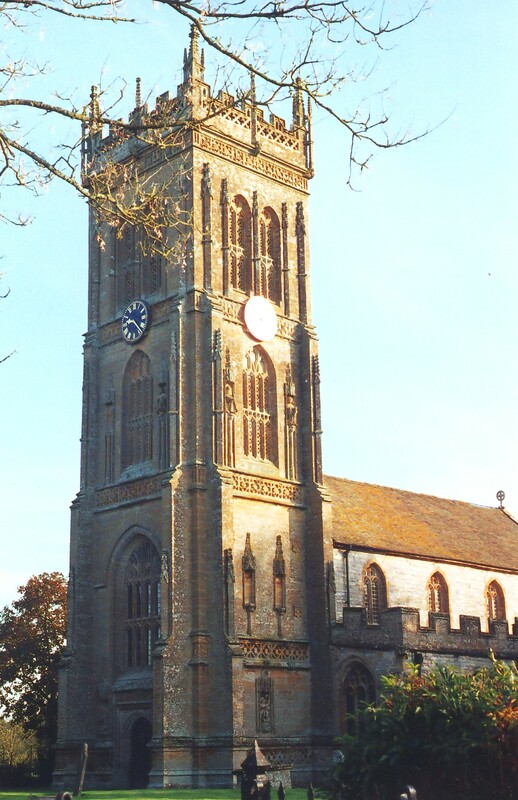 Allen had set out twenty years earlier in his book The Great Church Towers of England (The University Press, 1932), and from among the categories that Allen proposed and Wickham subsequently accepted, the Quantock Group displayed for Wickham the "Somerset tower par excellence", whose very best representative member - and not only for its tower - was St. Mary's, Ile Abbots. Of St. Martin's, however, he had little to say, except by way of criticism: "At Kingsbury the [tower] buttresses are too shallow, have been placed too far from the tower angles, and cease before the last stage; the result is that the pinnacles resting on them do not appear in the outline when the tower is seen diagonally; further the plain part below the battlements is too wide. These factors render the crown far too heavy, and vitiate the design." There is some justification for these remarks for, especially in silhouette, the battlements and pinnacles do look over-wide for the bell-stage below. Yet these are pettifogging details when the merits of this noble building are considered as a whole, with its Ham Hill stone tower contrasting beautifully with the aisled nave of blue lias. 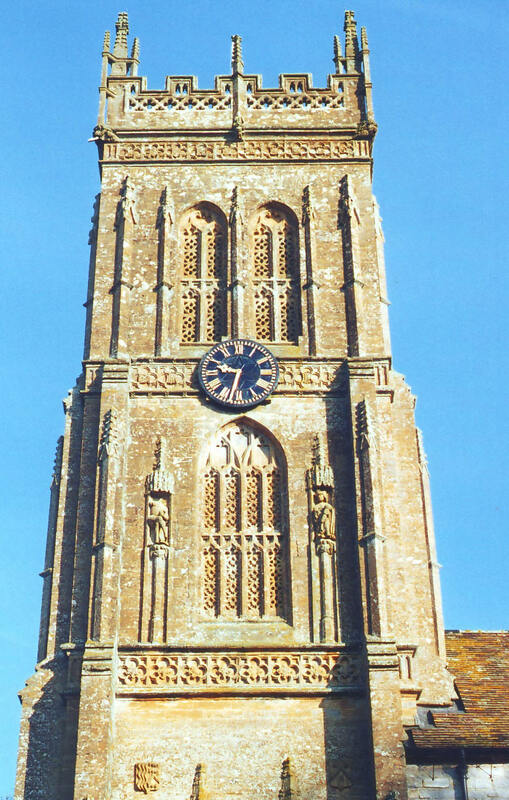 Moreover, for sheer richness of detail, St. Martin's is arguably not only equal but superior to most other members of the Quantock Group, including St. Mary's, Ile Abbotts. The tower then, rises in four tall stages demarcated by bands of blank quatrefoils, including one around the base, to a final band of quatrefoils at the top, followed by surmounting openwork battlements formed of quatrefoils in lozenges below the embrasures and pairs of little trefoil-cusped arches in the merlons. There are pinnacles rising from the mid-points of the walls and groups of pinnacles at the corners, each formed of a large pinnacle in the centre and three small ones set at 120° around it, and the projection of the battlements over the bell-stage is such that the pinnacles at the wall mid-points and the outer pinnacles of the groups of three, appear corbelled out beyond the parapet and tied in by braces. (See the photograph, right, taken from the south.) The tower is supported by set-back buttresses as far as the bell-stage, with tall crocketed shafts set diagonally on the three tiers of set-offs. The pair of two-light transomed bell-openings in each wall, with recticulated and Somerset tracery, have more shafts between and to either side of them. 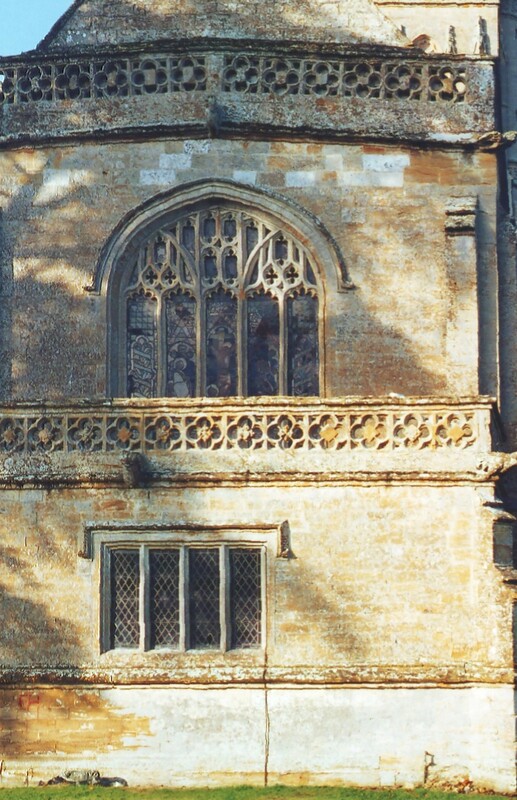 The third stage (below the clock) has a four-light transomed opening in each wall, again with Somerset tracery but here with tracery in the window head formed of the subarcuation of the lights in pairs, bisected by through-reticulation, and on either side of these openings, there are canopied niches supported on tall shafts, which retain their original carved figures. The two lower stages of the tower have no windows to north or south but instead, on the S. side, there is a large canopied niche in the lower stage and two slightly narrower ones on short shafts in the stage above. (There is one niche at this level to the north.) The W. wall has a doorway with continuous mouldings and spandrels filled with leaf carving, and a five-light transomed window (illustrated in the thumbnail, left) with outer lights subarcuated in pairs, a central light defined by strong mullions, and latticed supertransoms above this light (light 3) and across the reticulation units beneath the subarcuations (i.e., above lights 1b-2a and 4b-5a). There are also large niches with crocketed canopies either side of the W. door, containing statues that are now headless, and a frieze of quatrefoils in lozenges, containing Tudor roses above. The date of the tower is probably c. 1500. The stair turret at the northeast angle rises only to the same height as the tower itself. The rest of the building consists of a four-bay aisled nave and a chancel with dissimilar chapels, although the two-bay chapel arcades are similar within. The S. chapel - now the organ chamber - continues the line of the nave S. aisle eastwards, but the N. chapel is cross-gabled and it is this and the chancel that are architecturally important. Walking clockwise around the church, beginning at the N. chapel, this is a splendid piece of work which is distinguished from the north, first, by the wide, embattled rood stair turret which does project above the adjoining roofs and which adjoins it to the west, and, second, by a large five-light transomed window, with double-trefoil-cusping of the lights beneath the transom and tracery above featuring the cinquefoil-cusping of the main and sublights, subarcuation of the outer lights in pairs, and a supertransom between the subarcuations, above lights 2b-4a. The E. window to this chapel (shown below left) is four-light and almost equally impressive, with double-trefoil-cusping of the lights below the transom, subarcuation of the lights in pairs, through reticulation and a supertransom between the subarcuations, above lights 2b-3a. The transomed N. window to the chancel sanctuary beyond, like the S. window opposite (illustrated below centre), presents another grand design, composed this time of ogee lights below and above the transom, subarcuation of the outer lights in pairs, and original and elaborate subreticulation forming pairs of little quatrefoils above lights 1b & 2a and 4b & 5a, and a latticed supertransom above a central light separated by strong mullions. 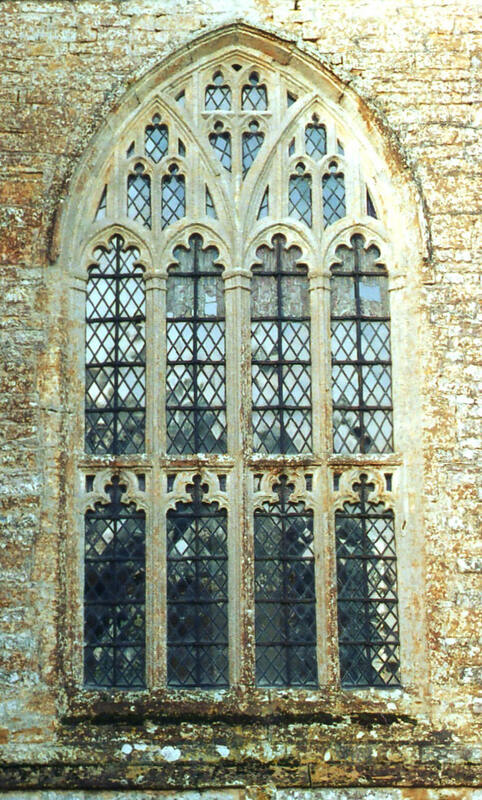 The sanctuary E. window (shown below right) is similar but its effect is diminished by the mediaeval vestry in front, notwithstanding that like the chancel above and behind, it has an excellent openwork parapet. 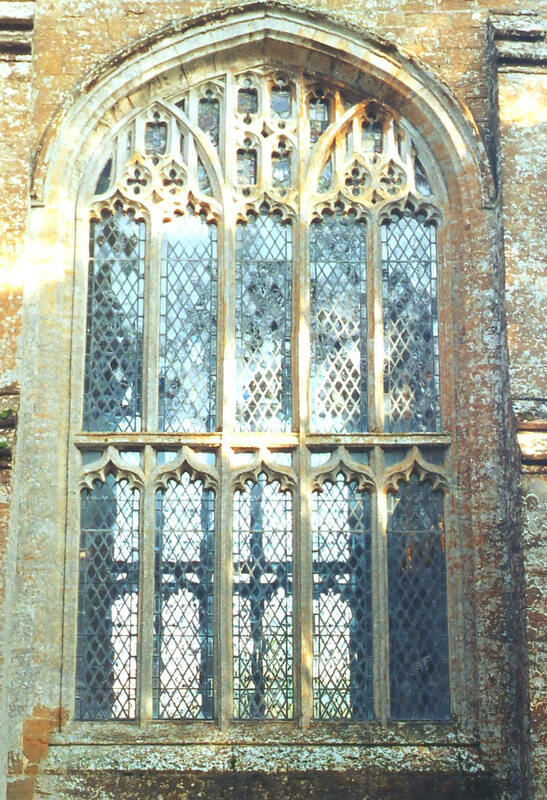 The S. chapel E. window is four-centred with ogee-arched lights, subarcuation of the lights in pairs, and through reticulation. The aisle windows are three-light with alternate tracery and two tiers of subreticulation. The embattled S. porch, which was formerly two-storeyed, has a two-light window above an outer doorway with two continuous flat-chamfered mouldings. Inside the church, the tower is again remarkable, this time for the extraordinary way it has been conjoined to the nave, for besides its own deep arch with panelled soffits sandwiched between slender semicircular shafts, of the type to be seen in the same position at St. George’s, Hinton St. George, Holy Trinity, Long Sutton, All Saints', Martock, St. Peter & St. Paul’s, Muchelney and St. Mary’s, Norton-sub-Hamdon, among other places in the region, as well as, sometimes, beneath chancel and chapel arches, there is also a second, wider and still deeper arch in front (i.e. towards the nave), also with panelled soffits, which appears to have been inserted in the space between the tower's internal (east) buttresses, which must themselves have been constructed for reasons of structural necessity. The leading edges of these buttresses are still visible, however, in the northwest and southwest corners of the nave, where they are adorned with two tiers of canopied niches, set between crocketed shafts and with tall crocketed pinnacles rising on top. The tower has a fan vault inside, above the W. window, with a central circular opening to permit the passage of the bell-ropes. The nave arcades are formed of double-flat-chamfered arches springing from octagonal piers. This is fourteenth century work that, to judge from the capitals, looks scarcely later than c. 1350 and so older than the aisle and clerestory windows. The clerestory consists of four pairs of two-light windows with alternate tracery, positioned over the apices of the arches below. The chancel, in Pevsner's words, is "gloriously lit", for the windows to the sanctuary and N. chapel, as has been described, are all very large, and except to the east, the glass is entirely clear. The chancel arch is tall and reminiscent of the N. arcade at Ile Abbots, for its capitals are similarly decorated with leaf carving that goes all the way round responds formed of three orders of differing section (in this case, a semicircular shaft followed by casement and wave mouldings). 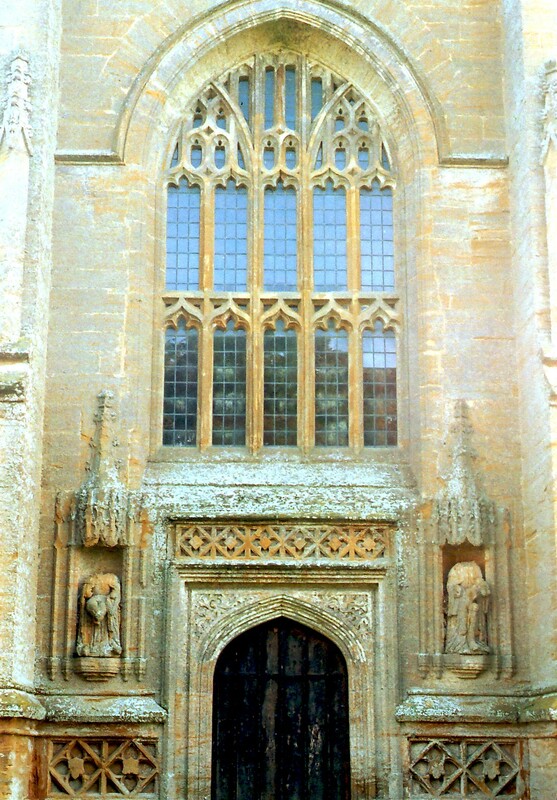 This is also the style of the two-bay arcades with four-centred arches to the N. and S. chapels, which if not the work of the mason responsible for the Ile Abbots arcade, must at least have been by someone familiar with that (unless, of course, the work at Ile Abbots derived from work already done here). There is also an arch between the S. aisle and S. chapel (organ chamber), but this consists of just an outer order dying into the jambs and an inner roll supported on corbels. 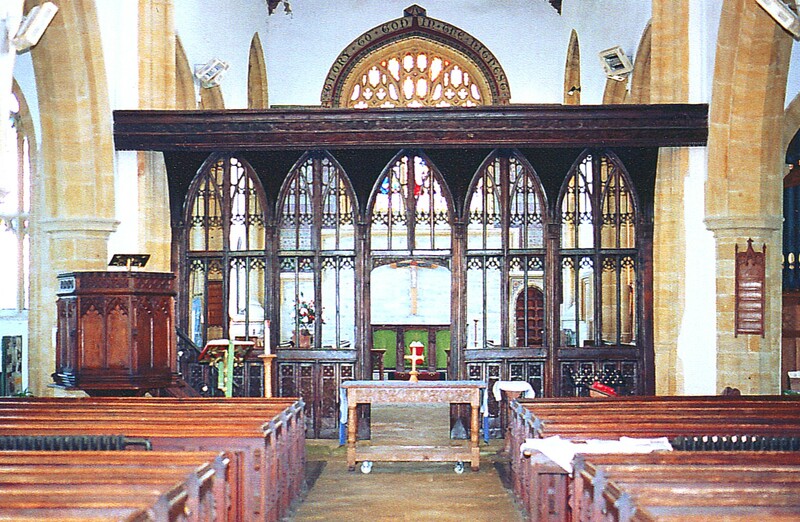 Finally, as in many Somerset churches, the furnishings fail to live up to the splendour of the architecture, but the rood screen is a fine piece of carpentry, which is formed of five, four-light sections, each with lights subarcuated in pairs and a central mullion reaching up to the apex in between. A transom runs across the whole screen, just below the level of the springing, the dado has tracery that includes quatrefoils set diagonally at the top, and there is a double frieze of leaf carving on the cornice. (See the photograph below.) Almost all the other woodwork in the church appears to date from the restoration of 1840.